We will be at Kilmartin House's Christmas Craft Fair this year - in the marquee - in fact, along with Jane and Eilidh Bruce, we ARE the marquee! The Christmas Craft Fair is from 11.00am until 4.00pm on Saturday and Sunday 3rd and 4th December 2011. We will be selling Cards and Prints, (we can take orders for prints not presently available), along with Gill's Christmas wreaths, 'Berries and Buttons' hand-crafted pictures, Christmas table centres with candles, mini-Christmas trees in festive red buckets and mini felt pictures in hand-painted frames. George will be doing watercolour painting demonstrations during the afternoons. 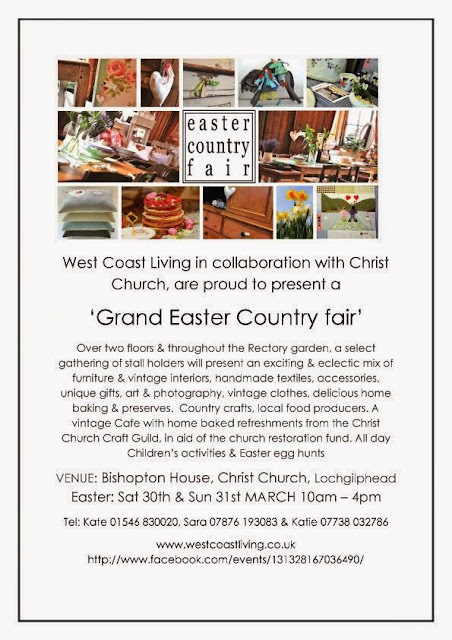 Jane and Eilidh will be offering cakes, crochet-work, handmade bags and hats for sale. And our neighbour and all-round prehistoric man Martin Murphy will have a fire blazing to keep us all warm, and hopes to have hot chestnuts on offer. He has also threatened to dress as a medieval Hot-chestnut seller (whatever that would look like).